Students who had the privilege of experiencing homeschooling have an advantage to the admissions board. Why? Due to their educational experience, they stand out amongst the other applicants. The many benefits of homeschooling have made colleges and universities realize the key characteristic that these homeschoolers exemplify. The understanding of a students homeschool experience to the admissions board proves to be significant during the application process for colleges in California. This allows them to get a sense of who you are as a person, your passions and community involvement, and what you’ve been able to accomplish throughout your educational years. 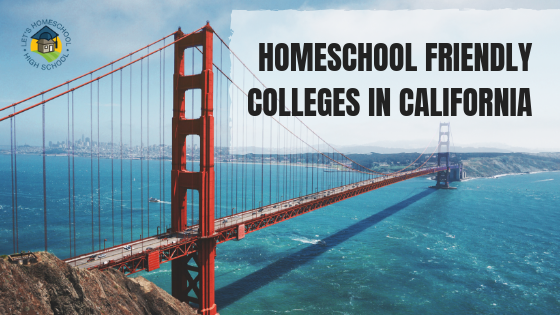 If you’re looking for California universities or colleges that accept homeschoolers, this is a good place to start. We’ve listed the top college requirements for homeschoolers so you can get an idea of what you’ll need to do if you’re interested in that particular school. We try to regularly update this page as more and more colleges and universities are becoming homeschool friendly. Stanford University – While not an Ivy League it is considered to be on par with the Ivies, this is a private research university is in Stanford, California. It is known for its academic strength and is ranked as one of the world’s top universities. Stanford is a place for learning, discovery, innovation, expression and discourse. Students chart their own paths of discovery, learning, and growth, and each journey is as unique as the individual. Stanford looks for applicants that show a series of serious, rigorous course of study distributed across the humanities, science, math, social studies, and languages. In regards to homeschoolers, they would like to understand how and why your family chooses to homeschool, how your learning process was organized, what benefits accrued, and what, if any, choices you had to make to accomplish this type of education. Cal Tech – The California Institute of Technology is a private doctorate-granting research university located in Pasadena, California, United States. Known for its strength in natural science and engineering, Caltech is often ranked as one of the world’s top ten universities. When looking at applicants they look at some of the following: academic ability, recommendations, background and courses taken to see if you have taken classes or done research outside of school. Students are not compared to one another, especially in regards to the way of learning. Homeschool applicants are assessed in the same way that traditional high school students are, no additional components are required. University of California Berkeley – The University of California, Berkeley is a top-ranked public research university in the United States. The University of California was founded in 1868 with a goal to “contribute even more than California’s gold to the glory and happiness of advancing generations.” Berkeley is a place where minds from all walks of life come together to explore, ask questions and improve the world. In regards to admissions, UC Berkeley reviews students using a Holistic Review process. This means that they not only look at academic factors but also non-academic factors. Requirement 1-Same admission requirements for students in traditional high schools. Complete a minimum of 15 college-preparatory courses (a-g courses) with a letter grade of C or better, with at least 11 courses finished prior to the beginning of your last year of high school. Claremont Mckenna College – Claremont McKenna College, one of the nation’s top liberal arts colleges, prepares students to make a difference. The College educates students for thoughtful and productive lives and roles of responsible leadership. The College attracts a student body that is broadly diverse and accomplished beyond the classroom. At Claremont McKenna College they acknowledge that students engage in a variety of approaches in order to achieve their education goals. For homeschooled students, there are no additional requirements for the admission process. The University of California Davis – The University Of California Davis is home of the aggies-go-getters, change makers and problem solvers who make their mark at one of the top public universities in the United States. Since they opened in 1908, they’ve been known for standout academics, sustainability, and Aggie Pride as well as valuing the Northern California Lifestyle. To be considered for admission to UC Davis, freshman applicants must earn a high school diploma (or equivalent) and satisfy the UC admission requirements, this is the same for homeschooled applicants. Biola University – Biola University is a nationally ranked Christian university in the heart of Southern California. Biola offers biblically centered education, intentional spiritual development and vocational preparation within a unique learning community where all faculty, staff, and students are professing Christians. Biola assesses applicants based on not only their academic achievements, but what makes the candidate special, and stand out as an individual. Homeschooled applicants will need to submit all necessary requirements that are required of traditional high schoolers. Concordia University– Concordia University Irvine, guided by the Great Commission of Christ Jesus and the Lutheran Confessions, empowers students through the liberal arts and professional studies for lives of learning, service, and leadership. The Concordia undergraduate program is distinctive among universities in California because of its nationally recognized Enduring Questions & Ideas (Q&I) Core program, and its Lutheran heritage that provides a thoughtful and caring Christian community. As a homeschool student, you’ll find that there are no extra admissions requirements for homeschool students at Concordia University Irvine. They welcome your experiences & perspective. Southwest Baptist University – Southwest Baptist University is a Christ-centered, caring academic community preparing students to be servant leaders in a global society. Southwest Baptist University is an academic community. Southwest Baptist University pursues excellence in teaching, scholarship and service by encouraging each member of the University community to live a Christ-centered life. Home-schooled students are an important part of the Southwest Baptist University student body and in regards to the application process, no additional materials are needed. Trinity University – California Trinity University is committed to becoming a premier academic institution by providing dedicated education excellence and preparing the students to become leaders to whom we can entrust the future of business and society. The University admits qualified domestic and international students who exhibit potential and aptitude to successfully complete the selected academic programs. Students seeking admission must submit all application requirements, including official academic transcripts, or records of all previous education at higher educational institutions(s) they attended. They are committed to the development of your intellect and character. Trinity is a homeschool friendly community. They welcome applications from homeschooled students, knowing that the unique opportunities and experiences of your education bring value to the student body. Azusa Pacific University –Azusa Pacific University is a comprehensive, evangelical, Christian university based in Los Angeles, California. APU is a leader in the Council for Christian Colleges & Universities and is committed to excellence in higher education. Applicants who are homeschooled and do not have an official high school transcript to submit to the university with the Application for Undergraduate Admission are not required to take the General Education Development (GED) Test or the California High School Proficiency Examination. Scripps College – Scripps College is a private liberal arts women’s college founded in 1926 in Claremont, California, United States. The mission of Scripps College is “to educate women to develop their intellects and talents through active participation in a community of scholars, so that as graduates they may contribute to society through public and private lives of leadership, service, integrity, and creativity.” As an internationally recognized leader in women’s liberal arts education, Scripps has an increasingly competitive admissions process that reflects the growing demand for a Scripps education. Scripps College welcomes applications from homeschooled students. They are committed to a holistic and thorough review of each application. University of California Santa Barbara – The University of California, Santa Barbara is a public research university and one of the 10 campuses of the University of California System. UCSB is one of America’s Public Ivy Universities. UC Santa Barbara offers a dynamic environment that prizes academic inquiry and interpersonal connection to inspire scholarly ambition, creativity, and discoveries with wide-ranging impact. UCSB leads an educational journey of discovery that stimulates independent thought, critical reasoning, and creativity. In regards to their selection process, The University of California uses a comprehensive review process when evaluating each freshman applicant. The Office of Admissions at UC Santa Barbara will use a variety of academic as well as non-academic factors when considering a student’s accomplishments. Academic and extracurricular achievements are viewed in light of the opportunities available to each student and the student’s demonstrated capacity to contribute to the intellectual life at UCSB. Requirement 1- Students must successfully complete UC-approved courses in these “a-g” subject areas with a ‘C’ grade or better. Requirement 2- Students must earn a minimum GPA of 3.0 (3.4 for non-California residents) in all a-g courses above. Requirement 3- All applicants must submit scores from the ACT Assessment plus Writing or the SAT Reasoning Test with Essay. University of California Irvine – The University of California Irvine is a public research university. Irvine was founded with a mission to catalyze the community and enhance lives through rigorous academics, cutting-edge research, and dedicated public service. They believe that true progress is made when different perspectives come together to advance our understanding of the world around us. As far as the admission process, UCI uses a comprehensive review process. Freshman applications are reviewed for completion of required college-preparatory coursework, required tests, demonstrated academic achievements, activities, talents, and skills — all in the context of your circumstances and experiences. They consider all information provided in your application, including your answers to the personal insight questions. Requirement 3- You must provide evidence of English proficiency to be successful in university studies at UCI.